Below are pieces I have made in the past and examples of hand-lettered items you can custom-order from me. Be sure to check out the online store for prints, custom calligraphy art, and printables. If you don't see what you want there, feel free to ask me for a quote on fully custom art! I am primarily a digital artist, but canvases are still possible—just about anything can be printed on a canvas! Or, you can ask specifically for a quote on a hand-painted canvas. The custom hand-lettering commission above is currently located in the lobby at Franklin Park Vision in North Spokane. The above are two client commissioned pieces—matching, for the same room, but one with more masculine features and the other with some more feminine calligraphy. I loved this project; it was a unique challenge. Wedding welcome sign, hand-lettered/hand-painted in calligraphy. These table numbers and wedding invitations were part of a styled photography shoot in March 2017. Kayleen Michelle took some amazing pictures and coordinated a beautiful photo shoot; you can see the rest here. Decor provided by Artifact Rentals. Locations included The White House in Coeur d'Alene, ID and Riverside Place in Spokane, WA. Many other vendors were involved; browse here for a full list. This shoot was featured in Apple Brides and PNWedding! These chalkboard designs were created for use in a rehearsal dinner in July 2018. Vanessa is a Pinterest strategist and digital marketing consultant for the creative client—in fact, she and her website are where I’ve learned basically everything I know about Pinterest! 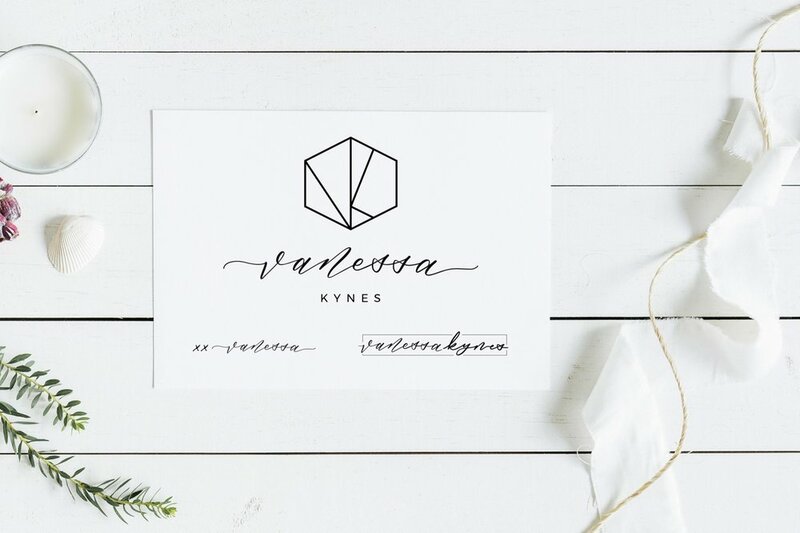 Vanessa’s brand is clean, modern, and refreshing. She needed a main logo, a smaller watermark to put on her pins, and a sub-mark to use as her signature. Lara d’Entremont is a blogger and biblical counselor in training who has a passion for teaching women to turn to God’s Word in the midst of their daily life and suffering to find the answers they need. She writes articles on theology, Bible study, relationships, suffering, anxiety, depression, idols of the heart, etc. The postcard-sized flyers below were made as part of my job at Grace Christian Fellowship Church. I feel they exemplify my style well, while also showing that I can evaluate and adapt to the audience of a given project—i.e., designing for a men's retreat is very different from designing for a women's discipleship group. I created six custom A2 greeting cards for Great Northern University here in Spokane, WA. Especially fun was the creative freedom to propose quotes from Scripture, the church fathers, and other believers. They needed to be black and white for economic printing fees. I also created two separate versions of each card—one version with full bleed (printing all the way to the edge) for professional printing, and one version with margins that could be printed in-house on Avery templates or regular card stock. art of being a lettering artist is flexibility — like taking whatever medium you’re given in stride! These whiteboard designs were made for ladies' events at Grace Christian Fellowship Church in Spokane, WA. These graphics were created as part of my job at Grace Christian Fellowship Church, and were used as backdrops for the projector screen during sermons. I included a couple concepts for “Our God Reigns” that I loved but didn’t end up using. The “Better Together” series has two graphics, one for each of our campuses. I loved the idea of having our actual congregations in the background. I love custom projects, and can’t wait to hear more about what you have in mind!